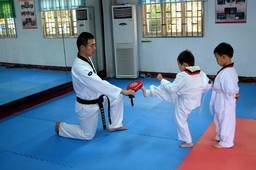 Taekwondo is more than just a sport, it’s a discipline for success in life. The relationship between student and a master at Wylie Taekwondo is a sacred one, with benefits reach-ing far beyond the four walls of the dojo. Most students will report it can infiltrate every area of your life. Here we have listed 7 key life benefits of choosing practice Taekwondo. Community is essential for building resilience in life. Everyone at Wyllie Taekwondo is treated equally, with courtesy and respect. Our positive and supportive community means that everyone has a place where they belong and no one is left behind, regardless of their skills or ability. Taekwondo gives students a clear structure and Well-defined grading examination system within which to develop their focus and concentration. Parents report great, calming results for high-energy children, especially those with ADD or ADHD. Learning is a critical life skill for just about every worthy endeavor. The Wyllie system of Taekwondo instils an insatiable appetite for learning in students. Presented in the right way, nothing is mundane or boring. Taekwondo is both an art form and a sport. It supports the development of physical strength, fitness, flexibility while sharpening reflexes and coordination. This improves ability in almost every other sport or physical endeavour. Knowing personal boundaries, increasing skill, achieving tangible goals while working outside your comfort zone all support the development of confidence and self-esteem. Working within a code of conduct & knowing how to control one’s own power and intensity is a skill student must master as their skill level develops.